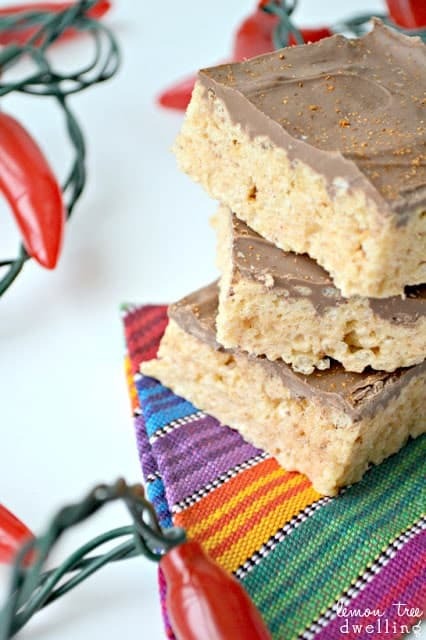 The sweetness of Rice Krispie Treats with the spiciness of cayenne pepper – an unexpectedly delicious combo….and just in time for Cinco de Mayo! OMG. He did. Which really threw me off….and not just because I was pregnant and couldn’t believe he would say no to me (but seriously…..can you believe he said no to me!??) It threw me off because we have always been the type to surprise one another with little treats – on birthdays, on anniversaries, or just because! For Jorden, it’s always orange tic tacs, raspberry iced tea, McDonald’s anything, Swedish Fish. For me, it’s Starbucks, peanut M&M’s, a bottle of wine, Twizzlers…..and, ahem, turtle sundaes…. So, as repayment for the treats I helped myself to a little too much of, I made Jorden these cayenne-spiced Rice Krispie Treats. With chocolate on top. Because I wasn’t as concerned with what would be the healthiest option as I was with what would be the tastiest option. You’re welcome, Jorden. 1. Melt butter in medium saucepan. Add marshmallows and stir over heat until melted. 2. 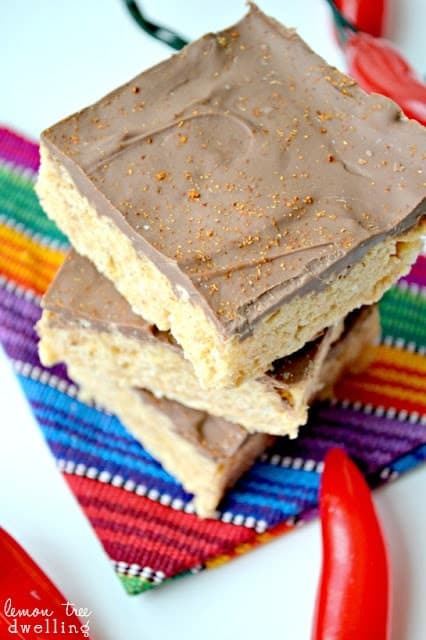 Remove from heat; stir in cayenne pepper and Rice Krispies until thoroughly coated. 3. Press Rice Krispie mixture into buttered pan. 4. 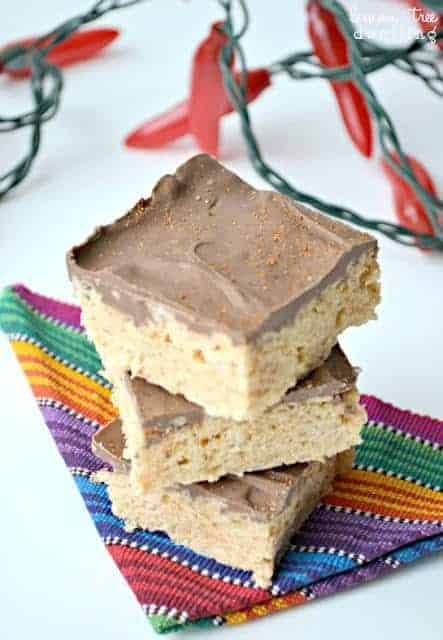 Melt chocolate chips and spread over bars. Sprinkle with additional cayenne pepper (optional). Interesting, I would have never thought of this! May have to give it a try! 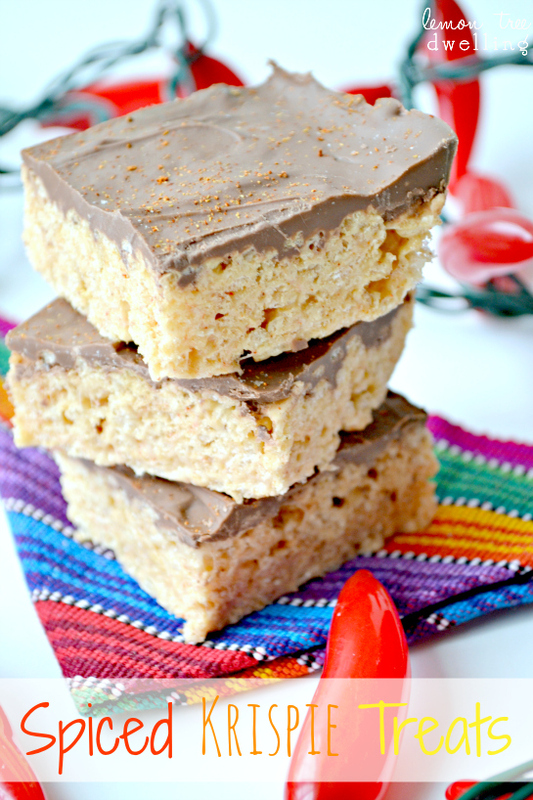 This sounds like a great combination of sweet and spice…perfect for Cinco de Mayo too. Oh, this looks so good! I’ll have to try this. 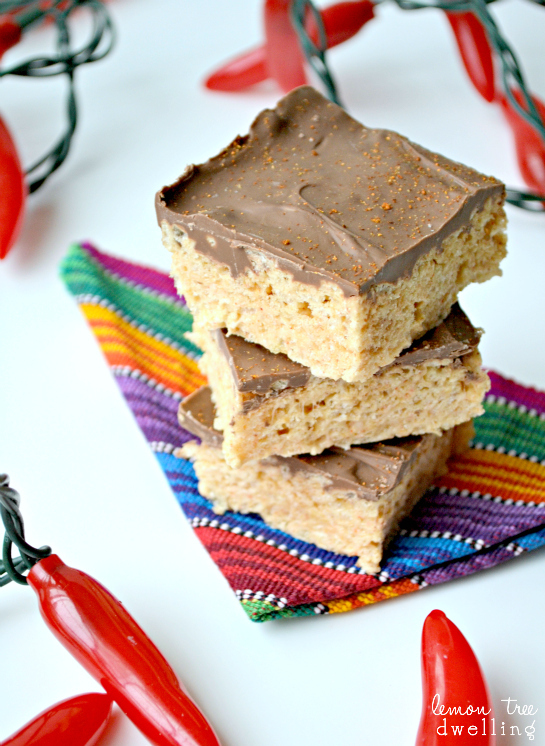 I love a little to a Rice Krispies treat! What a yummy looking treat. I like your twist. Please share your recipe at Pin It Monday Hop#7. See you there. I can’t believe he said no either! You have created a wonderful recipe! I bet the sweet and hot is great – it is one of my new favorites! Oh wow, these sound different, but I can’t wait to try them!! Thanks for sharing!